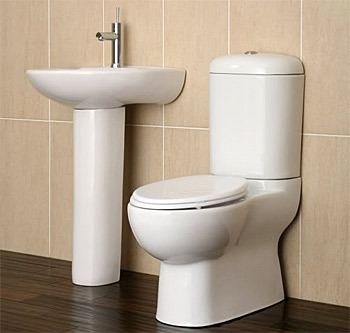 By far, most toilets are produced from vitreous china, which is ceramic molded part with a porcelain enamel coating. Most types of simple damages can be repaired with the Quick Glaze system after the etching process and primer, which are discussed in the cast iron section, are applied. Since toilets are produced to match the color of bathtubs, it is normally possible to order the correct color for a toilet repair. Sometimes, the Poly-Filler can be used as an adhesive to re-attach a broken piece or section. For example, a broken lid can be put back together, when replacement is not an option, by using the filler to glue the pieces together. When using this option, it should be reinforced using our binding resin and fiberglass mat. Not all areas of a toilet accommodate a satisfactory repair or refinish job. The interior of the bowl is the worst scenario, and repair or refinish should not be attempted.